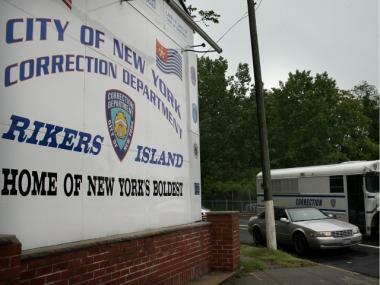 Two Rikers Island supervisors were found guilty of trying to cover-up a 2006 prisoner assault, May 14, 2012. SOUTH BRONX — A Bronx jury convicted a former Rikers Island warden and a Corrections Department captain Monday after finding them guilty of falsifying a report on the assault of a prisoner. Former deputy warden Gail Lewis, 49, and current captain Sherman Graham, 42, filed a false "Use of Force Report" about the incident in which Graham was accused of using unnecessary force against an inmate during a training session at the Robert N. Davoren Center on Rikers Island. Graham was also alleged to have instructed 14 new recruits to file false reports about the incident, according to the City's Department of Investigation. “There is no room in the City’s jails for supervisors who betray the public’s trust by misrepresenting the truth and concealing assaults in the City’s jails," DOI Commissioner Rose Gill Hearn said in a statement Monday. "Today, these defendants are being held to account for trying to cover up their roles in an inmate assault and now stand convicted felons." Graham first reported that the inmate attacked him and he hit back only in self-defense. Graham is still receiving a salary of about $94,000, and is prohibited from having any contact with inmates. Lewis, who retired in December 2009, was making about $104,081 when she left. The DOI started the investigation after a tip they received, following an anti-corruption lecture conducted for new recruits before their graduation. A jury found both Lewis and Graham guilty of multiple counts of falsifying business records in the first degree and offering a false instrument for filing in the first degree, both class E felonies, as well as official misconduct, a class A misdemeanor. They are expected to be sentenced on July 9. The top charge carries a prison sentence of up to four years.